Find out what tactics robocallers are using to steal your personal information and recorded voice authorizations, and get tips to help you avoid being scammed by them. Robocalls are an annoyance and a threat that is increasingly taking over Americans’ phones. A robocall is an automated phone call with a pre-recorded message. 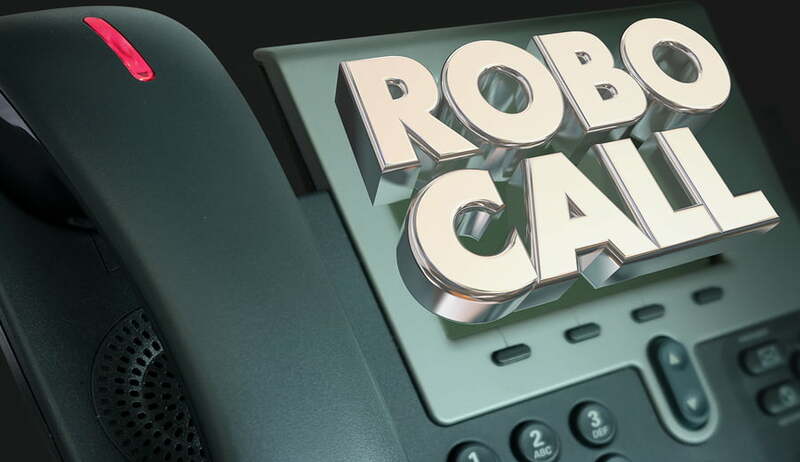 While these types of calls are sometimes used for legitimate sales or political purposes, robocalls are now commonly used by scammers trying to steal money or identities. According to Clutch’s recent survey of nearly 700 U.S.-based phone owners, more than half of people (52%) receive at least one robocall daily. Experts estimate that by 2019 nearly half of all cell phone calls will come from scammers. They are also effective – Americans lost $9.5 billion to robocall scammers in 2017. By May 2018, the number of robocalls increased by over 45% over the year before, for an average 4.2 billion monthly robocalls. Robocalls are a profitable industry for criminals. Technology makes it easy and inexpensive for them to operate, yet nearly impossible to get caught. As robocalls increase to epidemic proportions, the tactics used to scam people out of money and identities become increasingly difficult to detect. In this article we’ll explain the dangers of robocalls and show you 3 common tactics scammers use to trick people into sharing their personal information or voice authorization. Both individuals and businesses should be aware of these tactics so they don’t fall prey next time a robocall rings their phone. With spoofing, robocallers mimic the first 3 to 6 digits of the recipient’s phone number in their caller I.D. This trick has been made possible by the rise of Voice over Internet Protocol (VoIP). Nearly half of people (44%) say that they receive a robocall with the same area code as their personal phone number daily. Spoofing makes it seem as if the call is coming from a nearby residence, tempting people to answer the phone with their guard slightly lower than normal. They may think a neighbor or local business is calling them. However, the robocalls aren’t coming from a local phone number, and in fact, often originate outside the U.S.
Spoofing also makes robocallers hard to track down, and thus to punish. Robocallers spoof domestic U.S. phone numbers, even though they may be calling from across the world. The 2009 Truth in Caller ID banned nefarious call spoofing, but the behavior persists. New technology, such as the STIR/SHAKEN call validation system, seeks to make call spoofing impossible. Robocallers look for ways to leverage trending topics that they can spin into scams. Health care and immigration are two topics that scammers have recently used to prey on people. These topics are deeply present in recent U.S. political debates and are thus at the top of people’s minds. Health scams are the most common type of robocall. Over one-fifth of people (22%) that are likely to pick up calls from unknown numbers say that robocalls most commonly relate to health topics. Health insurance calls are an excellent opportunity for criminals to extract personal information from people who pick up the phone. After offering low-cost or scaled-down insurance plans, the conversation moves toward asking for a payment to guarantee or hold the policy. Besides risking sharing their bank information with scammers, people often give up other personal information such as their birth date or Social Security number through the conversation. It may feel like natural information to give when discussing healthcare, and the victims don’t realize they aren’t speaking to legitimate healthcare providers. Sometimes, robocallers are selling “skinny” or short-term health insurance plans that states are increasingly banning due to their poor coverage. Other times, they steal people’s personal information and the health insurance never materializes. Immigrant scams prey on the fears of immigrants by demanding money to clear up a “problem” that might cause them to get deported or investigated. For example, a recent scam targeted Mandarin-speaking Chinese immigrants, telling them they had been tied to some type of criminal activity. The scammers demanded the immigrants wire money in order to resolve the case, so they wouldn’t be arrested or deported. Thirty people eventually came forward and reported the calls, but not before getting scammed out of a collective $3 million dollars. Once the scammer captures a recording of the word “yes,” it can be used to authorize charges to that person’s utility and credit card companies. Robocalls can also use AI to answer people’s questions and further the conversation, perhaps misleading some into thinking they are speaking with a real person. A 2013 robocall circulated in which AI-powered chatbot tried to sell people health insurance. When asked if it was a robot, it responded with answers like “I’m a real person.” However, the limited capabilities of the chatbot exposed its true nature. As the rate of robocalls and scams continues to rise, it’s increasingly important to take preventive measures. The first step is to understand that incoming calls can’t be trusted. Next, register your number with the National Do Not Call Registry. Finally, consider robocall-blocking apps such a Hiya or Nomorobo to block and divert robocalls. Businesses can invest in human resources, like a virtual receptionist, to screen robocalls. Neighborhood spoofing, trending topics, and pretending to be human are all common tactics of robocall scammers. Understand their motives and tactics to help avoid being scammed by robocalls.